So, in part one of the rice cooker series, I gave a basic overview of how to use a rice cooker in the most basic, straightforward way. And while I enjoy plain rice with flavorful, saucy dishes like stir-frys, sometimes plain rice is just, well, plain. Boring. Thoroughly unexciting. So the rest of the rice cooker series will be devoted to giving you ideas for how to expand on basic rice without putting out a lot of extra effort. There is a basic formula for seasoning and enhancing grains, and rice is no different. Salt and pepper are always essential to bringing out the best flavor in grains. From there you can try substituting the water in your rice cooker with using stock or broth to cook your rice. Other options include substituting a small portion of wine or soy sauce for some of the cooking liquid to add a greater depth of flavor. You can also add a bit of oil or butter to your rice, if you are feeling really decadent. Spices also are a quick, tasty addition to rice, and give you what I like to call free flavor. For instance, one of the things I like to do when I’m making rice for Indian food is to add some turmeric, bay leaf and cardamom, along with some salt and pepper. It gives the rice a wonderful yellow color, a sweet aroma, and adds almost no extra calories, fats or sugars. You can also add finely chopped vegetables to the rice as it cooks. Milder members of the allium family, such as shallot or scallions, add wonderful flavor. You could also use carrots, onion or celery. The key is to chop your vegetables small enough so that they cook by the time the rice is finished. Have fun experimenting, and if something doesn’t work out as well as you hoped, make notes and adjust it slightly for next time. As long as you keep a consistent grain/water ratio, things shouldn’t get too out of control. So at this point, I’m sure you’ve all had enough of me waxing poetic about all the potentials of using a rice cooker and want some concrete examples. Well, gentle reader, you are in luck. 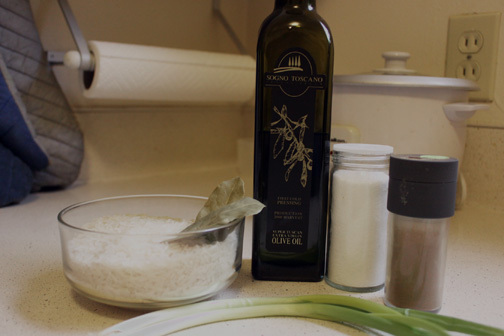 Here is a simple recipe for making rice with scallions and olive oil. All in all, it ought to take you about an additional five minutes beyond plain rice, and provides much more flavor and excitement. I paired it with some roasted veggies and fried fish, and it was awesome. I hope you enjoy it. Rinse rice thoroughly, until the rinse water runs clear. Put rice into the rice cooker with the appropriate amount of water, and all the other ingredients. Start the rice cooker. When the rice is done cooking, let stand for 10 minutes. Fluff with a rice paddle and allow to stand another 5 to 10 minutes before serving. 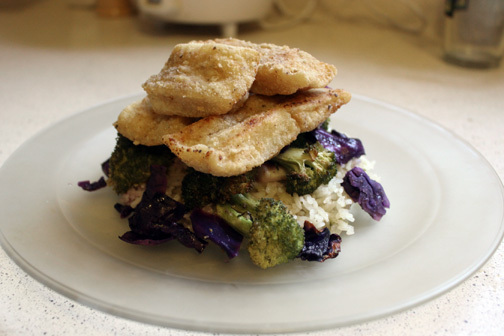 This is my complete meal, after I roasted some broccoli and red cabbage, and pan-fried some basa in a mix of semolina and all-purpose flour. It was fantastic, and the addition of a few ingredients to the rice kept every bite full of flavor. As you can see, a bag of rice and a rice cooker is a cheap, yet ultimately powerful combination. It greatly simplifies the cooking process of rice, allowing you to easily incorporate this cheap and nutritious ingredient into your cooking. This basic formula also has the potential for numerous variations without much additional effort. I hope that whether you have a rice cooker, buy a rice cooker, or simply cook on the stove top, you see how cheap and easy it can be to start building a substantial meal. I figure that the photos are a helpful way to give extra detail to my explanation. Glad you liked them! That's a great question, Melissa. I've tried a few variations on rice, and found slightly different results each time. I have sauteed green onions and garlic in a small pan, and then added this to the rice cooker with little problem. 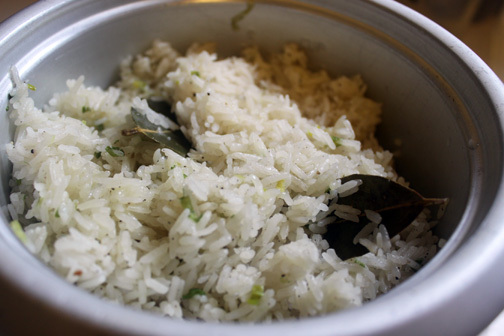 If you are adding a lot of extra stuff, it may absorb some of the water, and your rice will come out under done. This happened when I tried to add onions and tomato paste for Spanish rice. If this happens to you, just add a bit more water to the rice cooker and restart it. It should shut off when the bit of added liquid is absorbed. Make sure not to stir the rice until it's done, or it will become starchy. Finally, I've found that adding butter or oil to rice – or any grain, really – helps keep the grains separated. I don't think risotto would work in a rice cooker for several reasons. First, as you already mentioned, the liquid is added to risotto step by step. Second, it is necessary to stir risotto pretty constantly, so as to break up the starches in the rice. This is part of what gives risotto its creamy texture. It would be difficult to do this in a rice cooker, since you'd have to continually remove the lid.I think, as you put it, the rice cooker is suitable for more "straightforward" cooking. Rices of most kinds, barley or quinoa would probably work well, after some experimenting with water levels. Risotto and couscous probably wouldn't turn out as well. Getting a rice cooker is a great idea. I’ve been using my aluminum one for 30 years and it hardly shows any use even though I use it frequently. One of the best investments I ever made and easiest to clean too. I’d like to see more recipes. for the launch. Mathews repeatedly claims maybe it’s the combination of the two that are to blame. Well take into account the impact of switching your mother in law’s hair to cotton candy crush saga cheats engine v 6.
of. I say to you, I definitely get irked while folks consider issues that they just do not recognize about. Superbe information. Merci, très apprécié!! If you wish for to improve your know-how only keep visiting this site and be updated with the hottest information posted here. read this weblog, and I used to pay a quick visit this weblog daily. alongside with Bleach and One Piece. care poate fi în întregime pe facebook aici . The publisher of this incredible Speaking tom game is Cyprus primarily based company. fungus naturally and maintains the optimal healthy by preventing the reoccurring of the diseases. on Viridian today and tomorrow and a good selection of flag versus flag and flag versus Brigand King takeover attempts. On leading of that, there may be still an enormous buglist in installer. Leave iTunes operating and by no means get in touch with it once once more. After you have carried out your iPad jailbreak, you can certainly have these apps. Maintain holding the House button down till QuickPwn tells you that the process has started. What do you all think the iPad mini will consist of? 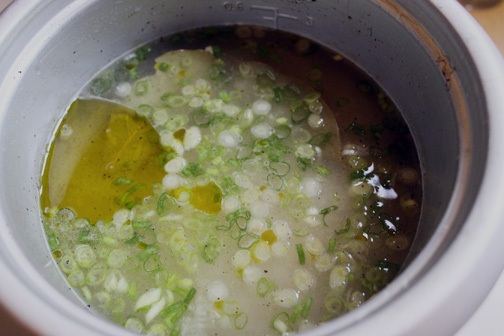 You are currently reading How to Use a Rice Cooker, part 02: rice variations & scallion rice at The Evolution of Eating.